What do you get when you add Microsoft, Google, eBay, Amazon, Yahoo and Facebook profits all together? A number that is less than Apple's profits, that's for sure. In its fiscal year 2012 that one company headquartered at One Infinity Loop bagged $41.7 billion in profit on $156.5 billion in revenue, a pretty decent 26.6% ratio, which most companies out there can only dream of, and which proves that disrupting an industry pays off big time even in a recession. The other Silicon Valley giants above raked in $34.4 billion in combined profits, though Microsoft's profit margin is slightly higher than even Apple's, and that's with all the R&D costs around Windows 8/RT creation and distribution. Another eye-opener on Apple's insane profits is the sum that all PC makers raked in as a whole - just south of $20 billion, which is less than a half of what Apple alone made, next to hardware giants like HP, Dell, IBM, Intel, Asus, Acer and Lenovo. 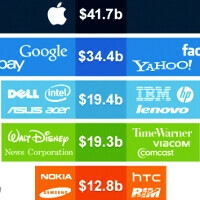 Turning our attention to the mobile industry, despite Samsung's rapid ascent, Apple dominates the overall profit chart there, too, with Samsung, Nokia, RIM and HTC combined making less than $20 billion. The cable and media behemoths like Time Warner, Comcast, News Corp and Disney, are also slouching against Cupertino's signature hardware/software ecosystem. and all the sh**p complains about the oil companies.............. first! There's nothing to be surprised of. Prices of their products obviously will tell you how Apple earned that billions of profits. I got sick from biased articles of Iphone Arena... If you are brave, publish a review comparing IPhone 5 with Nokia Lumia 920... What will you say about your lovely baby apple here?? You would never ever do that .... at all. calm down, you just shown how immature people are getting on here phonearena isnt biased, if they were why would they bother reporting on anything else. yes certain reviewers on here let there bias rule there articles but to say the entire site is biased is stupid and yes id like to see a comparison between the iphone 5 and 920 and for it to be fair but im not gonna moan about it. me tooo disperately waiting for lumia 920 vs iphone 5 review... and also for lumia 920 vs gs3 review so that my dream loving phone kick both of them is their asses..
if u don find that review here then look for other sites that do have the review. P.S. i too wanna read the review, but not gonna moan bout it. An Apple a day, keeps the stocks at bay! How much is Pablo Escobar worth? I hope this site does not turn out in misleading people like the other Apple fan-boy sites. Yea I was looking at that to. I see sometimes on this site they have articals that contradict each other. I don't buy that, Apple fudges it's numbers and pads the books really badly. They'll have one set of figures one day and then have a completely different and higher set of numbers the next. Also their products cost way too much for what they're worth. You can either buy a MacBook Pro for $2500 or get a Dell with the same specs for $500. So of course Apple is going to make boat loads of cash, they sell at such outrageous prices.The MacBook Air, the small one cost $1000 when you can get a netbook with the same specs for $300. This chart is very misleading, especially when Phone Arena reported that Samsung made around $12 billion last quarter and also reported that Apple profit margins were down too. I would love to see this Dell with the "same specs for $500" as the Macbook Pro as well as this netbook. We'll be waiting. Bhehehe! No surprise here! Apple now's flying in another orbit! Jealousy rears its ugly head. Instead of just adding the numbers and saying this company is doing better than all these other companies look at the figures in context as well. MS had a record year of almost 74 billion dollars in revenue and its profits were hit with an almost 7 billion dollar deduction still earning an healthy 17 billion profit. When a company any company can triple their profits from 10 years ago I would say that company id doing well no matter what the analyst say. Wow. That about sums it up. its not a shocker that they will earn that much... remember this.. over price phone - the iPhone over price and oversize iPod - the iPad over price reader - the iPad mini over price loptop and desktop - the macs over price fruit- APPLE!